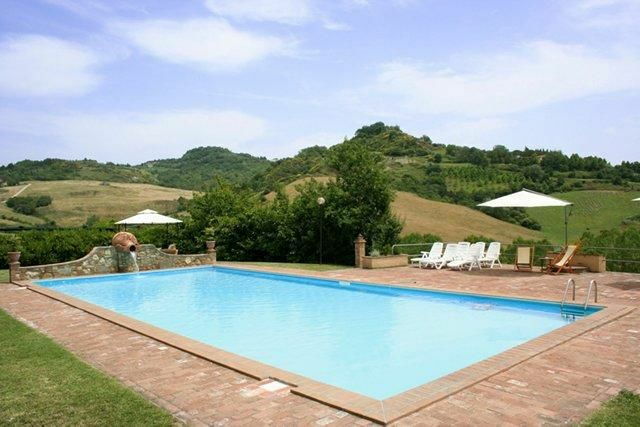 Beautiful farmhouse recently restored situated in a quite and panoramic position on the green hills surrounding Pisa. This nice property comprises 6 comfortable apartments, all of which tastefully furnished in typical rustic Tuscan style. All apartments are provided with screens and a private gazebo in the garden equipped with table and chairs. The main building also offers a shared reading room with fire place, a veranda and a shared laundry room. The access to the property is via an unpaved but well-maintained road. Parking within the grounds. Pets are allowed on request. Distances: Montefoscoli with food shops 4 km away, Forcoli with all kinds of shops 12 km, Pisa 35 km, the lovely town of Volterra 30 km, Pontedera 16 km, Castelfalfi with golf course and tennis court 7 km away. At guests’ disposal: large shared equipped garden, swimming-pool (15 x 7 m – maximum depth. 1,8 m – open from 01/05 to 30/09), solarium, barbecue, veranda, reading room with fireplace, bar and restaurant available for the guests of Borgo delle Colline only (to be book on the spot). Extra services: baby bed available free of charge. Maid service available by arrangement at € 12,- / per hour (to be paid on the spot). Baby-sitting service available at € 12,- / per hour (payment on site). Restaurant open for breakfast, lunch and dinner. Possibility to arrange nice walks and horse-back riding (€ 18,- / per hour to be paid on the spot) in the surrounding area. 34 m2 1st floor: living-room (satellite TV) with sofa-bed, kitchen corner (oven, freezer, dishwasher, American coffee maker, orange squeezer) and dining area, bathroom with shower, double bedroom. Extra bed available on request at € 60,- / per week or at € 10,- / per day.